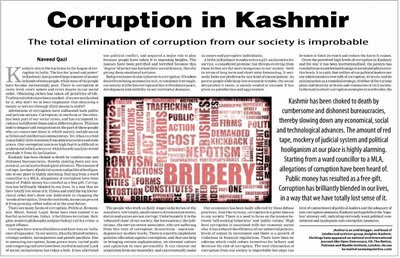 Kashmir sits at the top brace in the league of corruption in India. The lust for 'greed and power' in Kashmir, has granted huge amount of money in hands of some people, while most of the people have become increasingly poor. There is corruption at every level, every sphere and every degree in our social order. Obtaining riches has taken all priorities of life. Traditional ethics have been mocked - if we are not shocked by it, why don't we atleast emphasize that obtaining money or a service through illicit means is sinful? Adventures of corruption have suffocated both public and private sectors. Corruption in one form or the other, has been part of our social strata, and has variegated incidence in different times and at different places. This has lead to despair and resignation on the part of those people who are concerned about it, which mainly include social activists and intellectual commentators. Yet, it has received remarkably little attention from administration and state actors. Our corruption rate is so high that it is difficult to understand which science or which benefit analysis would preclude it from its inclination. Kashmir has been choked to death by cumbersome and dishonest bureaucracies, thereby slowing down any economical, social and technological advances. Elections for pro-Indians and massive agitations for separatists have given nativity to immoral practices -- 'speedy money' through 'fat levy bribes.' The amount of red tape, mockery of judicial system and political hooliganism at our place is highly alarming. Starting from a ward councilor to a MLA, allegations of corruption have been heard of. Public money has resulted as a free gift. Corruption has brilliantly blended in our lives, in a way that we have totally lost sense of it. Unless and until the top hierarchical order don't show any dedication in chopping the 'weeds of corruption,' from the root levels, no one can prevent it from growing, either today or in the near future. There are many facets of corruption. Political. Economical. Moral. Social. Legal. Some have even tainted it to be as fearful as terrorism. Infact, it facilitates terrorism. Religion, western philosophy and psychology calls it a crime - a major offence. Corrupts have learned boldness and have won an 'influence of expansion.' In our society, it has facilitated outlaws, revenge seekers, incompetents and pseudo pacifists. Due to menacing corruption, home grown wars, varied goals and competing cultures have been institutionalized. Social inclusiveness has taken a halt. It has alleviated our political conflict, and acquired a major role to play because people have taken it to imposing heights. The masses have been petrified and terrified because this 'degree' of action has hacked their social domain, thereby giving them emotional tortures. Bad governance is also inherent to corruption. If leaders desist from being accessories to it, or condemn it strongly, our society will be less corrupt and this will enhance peace, development and stability in our territorial domains. The people who work on daily wages in factories or the mazdoors, rehri wala, small owners of convenient stores, darzis and wazas are not corrupt. Unfortunately it is the 'educated class' of our society, the bureaucracy, the politicians, the service sector associates, who are suffering from this trait of corruption - favoritism - nepotism - degeneracy, in other words. There is a need to implement genuine education against corruption, and that can help in bringing certain sophistication, an elevated culture and optimism in ones personality. It can cleanse out skepticism from our mentality, and can eventually make us aware and perceptive individuals. A bribe in Kashmir is endorsed as a gift, an incentive for service for a considered promise; but threats evolving from these bribes are far more dangerous to our society - both in terms of long term and short term forecasting. It seriously halts our platform for any kind of emancipation. As poorer people slide deep into economic trouble, the social devastation it causes, is merely evaded or excused. It has given us putrefaction and aggravation. Our economics has been badly affected by these debase practices. Just like tyranny, corruption is a great disease to any society. There is a need to focus on the tension between 'self-seeking behavior' and 'public values.' High levels corruption are associated with our economic sector also. It has reduced the efficiency of our industrial policies, levels of output in investment and there is a growth of violations in financial regulations. There have been no reforms which could reduce incentives for bribery and decrease the risk of corruption. The total elimination of corruption from our society is improbable but steps can be taken to limit its reach and reduce the harm it causes. 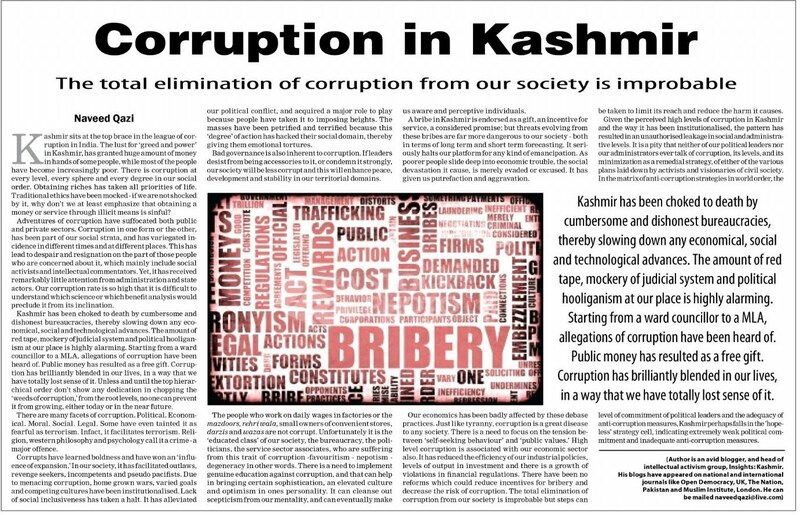 Given the perceived high levels of corruption in Kashmir and the way it has been institutionalized, the pattern has resulted in an unauthorized leakage in social and administrative levels. It is a pity that neither of our political leaders nor our administrators ever talk of corruption, its levels, and its minimization as a remedial strategy, of either of the various plans laid down by activists and visionaries of civil society. In the matrix of anti-corruption strategies in world order, the level of commitment of political leaders and the adequacy of anti-corruption measures, Kashmir perhaps falls in the’hopeless’ strategy cell, indicating extremely weak political commitment and inadequate anti-corruption measures.